Become part of the team that makes a difference! Koios and Novathon #withPBZ – Get ready to discover new ways of banking! The project was co-financed by the European Union from the European Regional Development Fund. The content of the website is the sole responsibility of Koios Consulting d.o.o. Our expertise in key technological areas enables us to develop and implement high-quality analytical solutions for our clients. The amount of data we collect today is growing rapidly. We help our clients face that trend by using advanced scientific methods and technological solutions. Applying data science implies specific knowledge and specific technologies such as artificial intelligence (AI) and machine learning. We upgrade our existing expertise in practical business analytics with innovative, advanced algorithms that enable us to build and apply predictive models in projects whose overall goal is extracting full business value from big data. Through internal projects at Koios, we support our employees as well as future young experts to develop skills and build knowledge in the fields of data science and business analytics. Building a well-modeled data warehouse is imperative for every company processing large quantities of data from multiple sources and a prerequisite for quality business analytics. Our key competencies are data integration through implementation of complex data models and business intelligence systems architecture. We offer our clients what they often cannot get by applying ready-made models: understanding of their business field (i.e. the financial sector) and developing the model’s foundation according to their organization’s unique business processes. Koios experts are certified specialists in Oracle, SAS, IBM (DB2, SPSS), and other tools in this area. Companies and institutions in the financial sector have recognized the competitive benefits of developing their own, specific software business solutions as well as Koios expertise in the field. We develop custom-made business applications whenever our clients require a unique functionality that is not part of a general purpose software or when significant savings can be made by developing a personalized solution, one entirely adapted to users’ needs as opposed to implementing a licensed software from a large supplier. When developing applications, software engineers at Koios use cutting-edge technological solutions such as Microsoft’s Visual Studio.NET development environment and ASP.NET MVC Core development model. Applying modern software development methods and gaining expertise in the same enable us to develop custom applications with minimal resource costs. At the same time, we make maximum use of modern operating systems’ functionalities and develop multiplatform applications. Sometimes, the data is not even structured adequately, which makes it impossible to immediately apply some of our previously developed models of analysis. In-house, Koios conducts a series of research projects focused on application of big data technologies and processing and analytics of large unstructured data. In our R&D projects we focus on data storage, automated data processing, and real-time recognition of valuable and useful data, to best prepare ourselves for implementation of these processes into complex solutions for our customers. The financial industry is facing the challenge of applying blockchain technology. Due to specific advantages of the blockchain model, this technology can be applied anywhere where a firm and unambiguous confirmation of data authenticity by an institution of unquestioned authority is needed. Our clients from the financial sector who base their businesses on reputation and authority are ideal for developing projects based on blockchain technology in the future. Through several in-house research and development projects (R&D), Koios develops skills and knowledge of its employees in the field of understanding and applying blockchain technology in developing solutions and applications. We believe that key advantages to working with Koios are our professionalism and confidence, which we have proven to our clients in numerous projects. We love what we do, and that is why we are the best in what we do. Below is only a selection of projects for some of the leading financial institutions in Croatia and abroad. The implementation and ongoing maintenance of the entire business intelligence (BI) system in a leading Croatian bank is one of the biggest Koios projects. No matter the institution, but especially in financial ones, there are many challenges facing a BI system as it should continuously monitor all changes in all data sources, display the changes in a clear and accessible way, and offer the possibility to implement extra products and services easily at a user level. With strong development of certain aspects of the financial industry, like mobile banking and mobile payments apps, many of these applications have become frequent users of banks’ analytical BI systems because they can offer additional services to their customers based on certain parameters. Koios has implemented a Customer Relationship Management system in one of the biggest regional banking groups. The aim of the implementation was to create a modern, advanced CRM system the bank could use in all the countries it operates in. Through the CRM system, the bank got a comprehensive overview of the existing assets of its clients and the products they use, enabling it to offer its clients additional products and create more efficient sales campaigns thanks to advanced methods of predictive analytics. In addition, Koios is specialized for developing additional modules for existing CRM systems. In one of the leading Croatian banks we implemented a financial advisory system for clients based on information about their available financial assets. This CRM module enabled the bank to inform their clients about finances in a high-quality manner. Koios helped two major Croatian banks align their businesses and IT systems with the IFRS9 reporting standard. This regulatory standard (International Financial Reporting Standard) was implemented with the aim of tracking risky clients and protecting banks from over-exposure to credit risks. Since aligning banks and financial institutions with the IFRS9 standard was required, many banks decided to purchase and implement external solutions. However, our experiences in developing and implementing our own solutions have resulted in our clients achieving not only high-quality reporting to the Croatian National Bank but a higher level of support to in-house teams in charge of credit risk assessments, too. We have participated in a couple of projects dealing with credit risk assessments. Financial institutions need this type of systems not only for aligning with regulatory obligations, but also for enabling the bank itself to calculate and assess its credit exposure to a certain client. In addition, we have developed a data warehouse system for a credit information registry. The system included aggregating multiple source reports and developing predictive models that produced reports about trends in the entire banking market. Implementing such solutions requires the experts at Koios to have a deep understanding of the ways banks operate, to be efficient at solving problems like insufficient or uneven data quality, and to cooperate with many different bank departments (including the IT and other business departments). Banks and other financial institutions must fight efficiently against money laundering, financing terrorism, and other criminal activities. They have to do it not just to comply with international and regulatory obligations, but to protect their own reputation as well. Identifying suspicious financial transactions requires advanced analytics over a large amount of data in real-time. Koios has developed data collection architecture to support applications that track suspicious transactions and, thereby, prevent money laundering. The application now successfully identifies high-risk transactions and notifies bank employees and departments who can then decide whether conducting further checks is necessary. Banks and other financial institutions are mandatory to generate numerous reports to the Croatian National Bank and to regulators of main banks in other countries. At the same time, the banks have to be in alignment with international banking standards. Because Koios participated in all the previous, major software deliveries and other IT support for a domestic financial regulator, we are thoroughly acquainted with the terminology, methodology of development, and comprehensiveness of requirements coming from this field. Our applications for regulatory reporting are in full compliance with the complex methodology of making such reports. Koios’s support to clients is particularly valuable in this field because there are frequent changes in types or contents of certain reports. These changes demand the system and the application to be highly flexible. Today, Koios team is made of around thirty experts with outstanding expertise in designing and implementing solutions for the financial sector. The head of Koios is constituted of a five-member board. Stjepan Pavlek Posavec is one of the original founders of Koios. He is a business analyst and a business intelligence consultant with experience in a wide range of business areas. However, his main areas of interest are data science, data modeling, system integration, and analysis and development planning of IT systems. Stjepan has significant experience working as a consultant in helping various organizations implement strategic initiatives and technical innovations, advance their skills and management, and transform their businesses. Moreover, he was in charge of many IT projects in banking. Regarding his international experiences, Stjepan began his career abroad even before he graduated from the Faculty of Electrical Engineering and Computing in Zagreb. A European traveler. On his numerous business and private travels, Stjepan experienced the beauty and charm of life in 32 European countries. Prone to challenges and a natural adventurer, he once won a bet proving that it is possible to get from Zagreb to Estonia in four days by hitchhiking. Ivana is a board member and a business intelligence consultant with rich experience in developing IT systems for the banking sector. She took part in projects dealing with the implementation of credit rating models, regulatory requirements and reporting, data warehouses, and reporting systems. Her experience encompasses analyses of business processes, data quality control, modeling of data warehouses, design and optimization of ETL processes as well as developing complex rule engine applications. While in the office, Ivana is completely focused on solving clients’ problems. Outside the office, she is a passionate dancer and a big fan of long walks in nature that help her recharge her batteries. Her list of favorite things does not include junk food or things on wheels, so do not expect to impress her with either of the two. Nino is a business intelligence consultant with broad experience in the financial sector. His experience extends over many domestic and foreign projects in the banking industry with a strong emphasis on risk management and implementation of regulatory requirements. Nino is well experienced in analyzing business processes, modeling, design, and optimization of ETL processes for data warehouses, and data quality control. He specializes in calculating capital requirements and Basel Accords – credit risk, regulatory reporting, and customer relationship management. He graduated at the Faculty of Electrical Engineering and Computing in Zagreb. A software and hardware expert. He put together his second computer when he was just 13. You can only imagine what he can do today! When not feeding databases, he is feeding fish – Nino enjoys aquaristics. Once he solved a client’s emergency over a cell phone while sitting in a boat at sea, dressed in a diving suit. 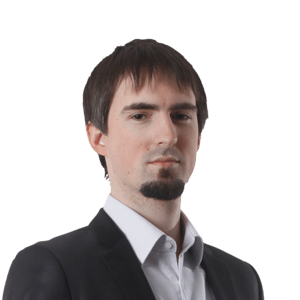 Vedran is a business intelligence consultant with comprehensive experience in the banking sector. His technical expertize is mostly related to data warehousing technologies by using Oracle technologies. He worked on many projects as a programmer, system architect, analyst, team leader or mentor. His areas of special interest are business analysis; development of data models and data warehouses; development and optimization of ETL processes for feeding enterprise models and data markets for internal, external, and regulatory reporting; and for supporting measuring and monitoring of credit risks and exposure. Vedran has a Ph.D. in computer science from the Faculty of Electrical Engineering and Computing in Zagreb. Vedran does not run away from challenges, business or sports ones. He once, while playing ball, scored eleven 3-pointers in a row! He likes to fix things around his apartment and on his scooter, loves Stephen King’s works, and enjoys reading popular science literature. Vlatko is a software architect and a developer on the .NET platform with extensive experience in software development using Microsoft technologies. Today, he mainly works on projects of implementation, optimization, and maintenance of complex business apps for the banking sector. He daily uses the knowledge he gained over the years when working on implementing desktop and web apps or software controls and framework, and in planning the information systems’ architecture. He is especially keen on introducing new technologies in existing information systems. 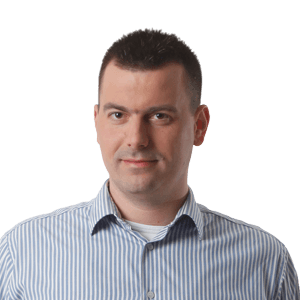 Vlatko is another member of Koios team that graduated at the Faculty of Electrical Engineering and Computing in Zagreb. A passionate Trekkie and a huge diving fan. Being the second generation of programmers in his family, he began programming already as a kid, messing around on the Qbasic code of the Gorillas video game. Today, programming is a game to him. On one occasion, he redesigned a system by making the calculations 1.000 times faster than before. Had not he been under such influence of his father, he would probably be a physicist today and spend his free time staring at the stars (as if he is not doing that already). A network of associates in innovative teams enable us to continuously develop and implement innovations in all areas of business, and working with the Koios team is one of the finest examples of this cooperation. 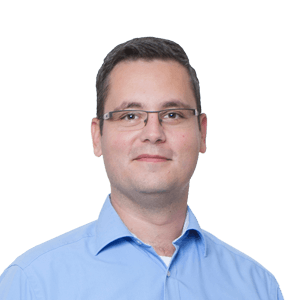 Neven Horvat, Senior Executive Director, Product Development Division – PBZ d.d. The whole Koios team adapted to our situation and our needs exceptionally quickly. While reinforcing our internal development team, their programmers showed great expertise and flexibility. They enabled us to develop the system in one of our key projects in a timely manner. Koios proved to be a reliable and high quality partner, and our collaboration was excellent. 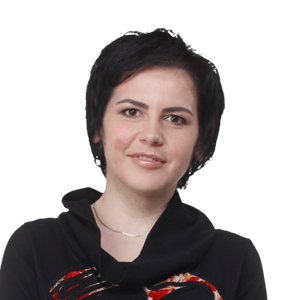 Relja Marković, Head of BI and IT Development – Addiko Bank d.d. Being sincerely interested in our projects and having a deep knowledge of banking and banking regulations, Koios has become a reliable partner on our most important projects, and its consultants true members of our team. 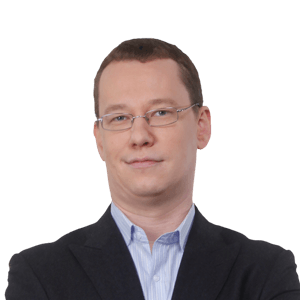 Matija Birov, Senior Executive Director, Risk Management Division – PBZ d.d. Would you like to work in a selected team of top experts in the field of implementing technology in the financial sector? Would you like to work in a dynamic company that adapts quickly to the market needs? A company that explores and applies cutting-edge technological solutions? We believe you are up to the challenge! All employees can acquire shares in the company. This is not a way of substituting financial compensation but an additional opportunity for employees to affect the company’s growth and development – and, at the same time, profit out of it. Overtime hours are paid, and the employees have a flexible working schedule and a possibility to work some extra hours and be properly compensated for such work. Koios is a very stable and secure company. We work with stable, big clients and businesses, and have excellent financial results that have been growing year after year. The sector we do business in will continue to grow in the long run, which opens many opportunities for doing business internationally and for building an international career. Koios is a pleasant place to work in. We nurture friendly and team relations among our employees. Due to the specific characteristics of the sector we work in, stress is not part of our work. When our employees work on a project for a longer period of time at the clients’ premises, the rest of the team provides full support at all times. On our numerous R&D projects we test new technologies and develop new solutions that we expect our clients will be looking for in the future. Moreover, we provide all our employees with an opportunity for continuing education. Our employees can choose from a list of benefits – additional types of insurances, gym membership or something else. Koios will meet their needs. Production of this website was co-financed by the European Union from the European Regional Development Fund. Koios is specialized in business intelligence and application development in financial industry. Our team is made of exceptional experts competent to most challenging projects.